t's mostly prophylactic. You know when people come to your door trying to sell you a religion, and you really don't want one, but they're so earnest and scrubbed you can't be mean to them, but if you admit you don't have or want a religion, you'll never get rid of them? You also can't blame the Great Penguin if you do something mean, as She would never tell you to do anything mean. She would never tell you to do anything. She assumes that, as an adult of sound mind, you realize that your actions have consequences, and that you won't do anything you wouldn't take responsibility for. The Great Penguin doesn't mind if you are a member of another church, even that yummy pasta-oriented one. But if you don't already have a religion, and you'd really rather not have one that makes you do any actual work, the Church of the Great Penguin may be for you. All you need to do is keep some food around in case the Great Penguin drops by (She’s a bit of a mooch.) Seriously, that’s it. Otherwise, what you do with your life is up to you. Ask the Great Penguin a question. She may or may not respond (She's a bit of a lazy bird) but if your question is amusing or interesting and/or if She's in the mood, you might see your question in the FAQ. 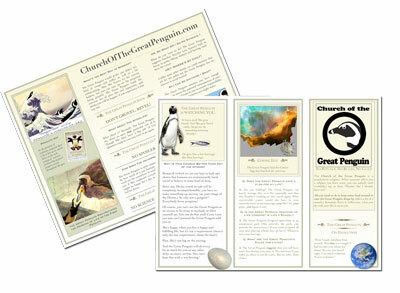 Grab your 'Church of the Great Penguin' official brochure, almost guaranteed to confuse the next missionary you encounter! 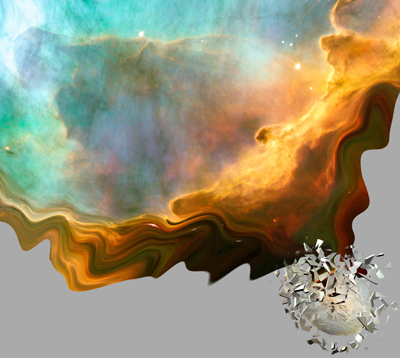 The Great Penguin laid the Cosmic Egg that hatched the Universe.